Roofs get hot in summer, causing attics to heat up, too. Much of that heat radiates into living spaces below. Carolina Energy Conservation can keep your attic cool with a radiant barrier. 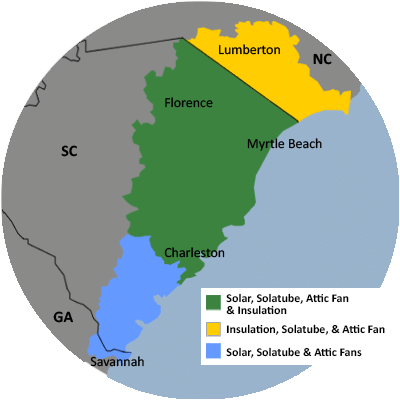 Carolina Energy Conservation installs radiant barriers in attics and are experts in saving energy through your attic, as well as many other parts of your home. For your Free Radiant Barrier Quote in South Carolina & North Carolina, call or e-mail us today! We serve Charleston, Myrtle Beach, Sumter and surrounding South Carolina & North Carolina areas near Pawleys Island, Summervile, Blythewood, Conway, Orangeburg, Hilton Head Island, Lancaster. Your Carolina Energy Conservation consultant will help you decide on the one that's best for your home. Carolina Energy Conservation can install a radiant barrier against the bottom of your rafters (or between them) to help improve cooling efficiency in the summer and heating efficiency in the winter. Call or e-mail us for a free quote for radiant barriers. Carolina Energy Conservation provides radiant barrier and insulation to Sumter, Charleston, Myrtle Beach as well as surrounding areas such as North Charleston, Mount Pleasant, Bluffton, Florence, Darlington, Goose Creek, Beaufort, Pawleys Island, Summervile, Blythewood, Conway, Orangeburg, Hilton Head Island, Lancaster. Call 1-855-410-0662 or contact us online for a home energy audit and insulation quote.